Hi everyone and welcome to day 4, the final day of January releases. 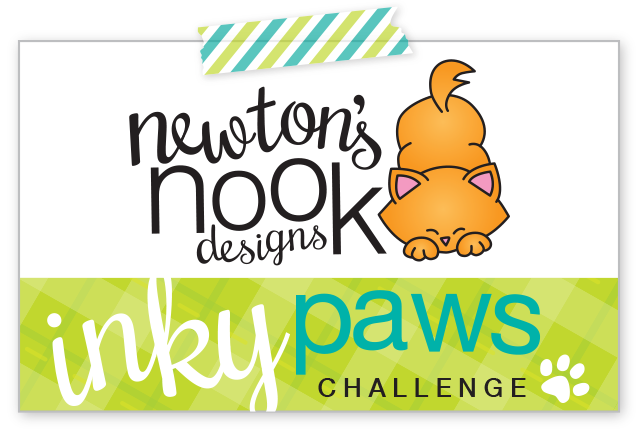 Tomorrow all these new products we've featured this week, will be in the Newton's Nook Designs Shop! For my first card I colored up two of the little typewriters, don't you just love them? And I mounted them on a scalloped circle die cut, which is on the scalloped die from Frames and Flags that I stenciled using the Tumbling Heart Stencil. I mounted all on a tiny black/white polka dot patterned paper and a little checked bow. My second card was really simple. 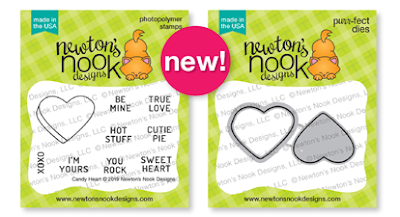 I used the layered heart die from the new Candy Heart stamp/die set. I stamped each heart with a sentiment from the set and mounted them on a white panel on top of the postage die from Frameworks Die set. I tied a little twine and my Valentine's Day card is ready to be mailed! Thanks for joining me this week, keep scrolling for your chance to win! 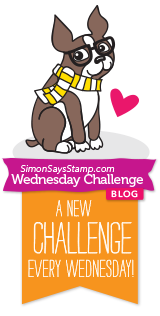 Day 4: Would you like to win both the “My Type” and “Candy Heart” Stamp Sets? Hi all, today is day 2 of the NND release and I'm super excited to share this card I've made using the new Caffeinated Cats stamp set. This full cardfront stamp coordinates with the largest die in the Frames and Flags Die Set or the Framework Die Set. 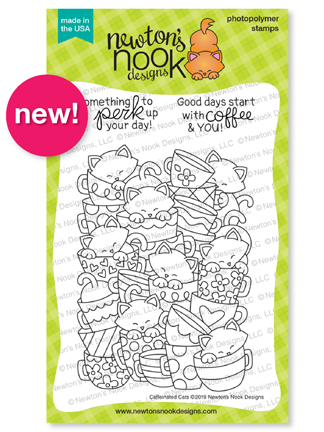 I love how Jen drew all these cute little Newton's playing around in the mugs and cups! I Copic colored the entire image and added some white highlights using my white gel pen. Then I cut my panel slightly smaller than the stitched line on my scalloped frame and glued all down to my kraft card base. 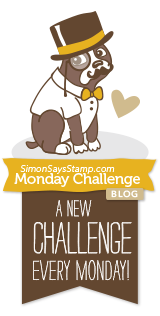 I hope you've enjoyed my project, be sure to keep scrolling for your chance to win this stamp!!! 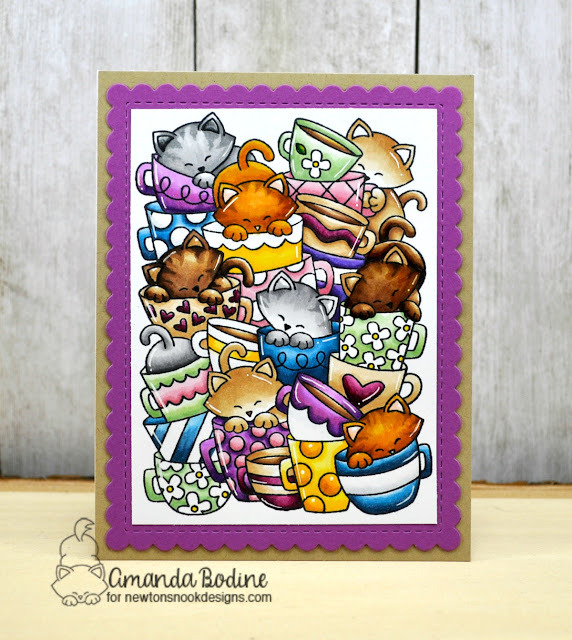 Day 2: Would you like to win the “Caffeinated Cats” Stamp Set? This stamp set will be given away to ONE lucky winner! 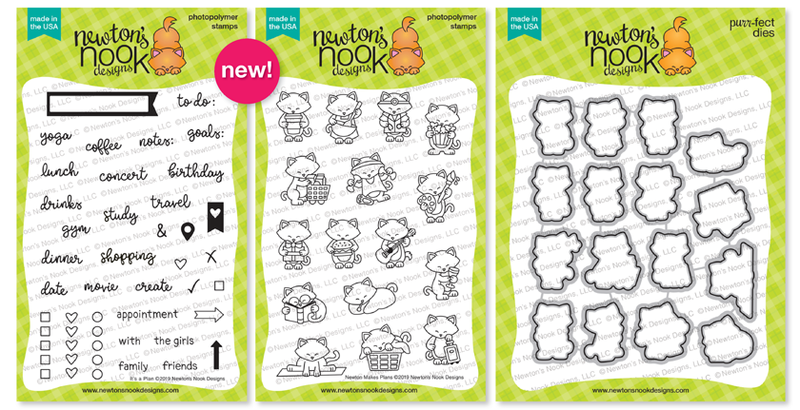 Hi everyone and welcome to day 1 of the January release over at Newton's Nook Designs! Today we're previewing a 2 brand new sets for planning, Newton Makes Plans and It's a Plan! 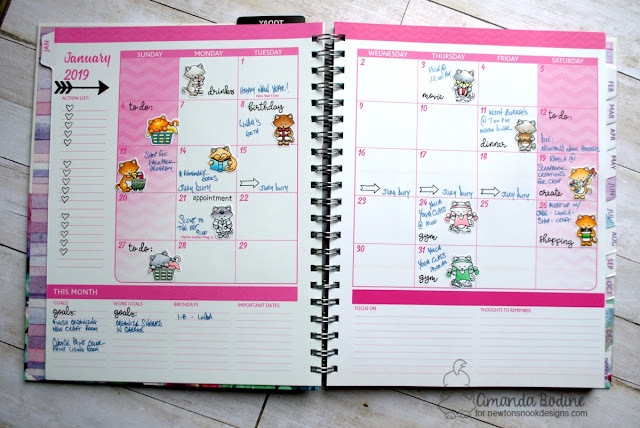 Now I really have no experience setting up a planner that's been decorated, but I challenged myself to set up my pages for January. And what I discovered is that I may have found a fun new way to map out my weeks. Using all the little Newton images to coordinate my tasks was really enjoyable! 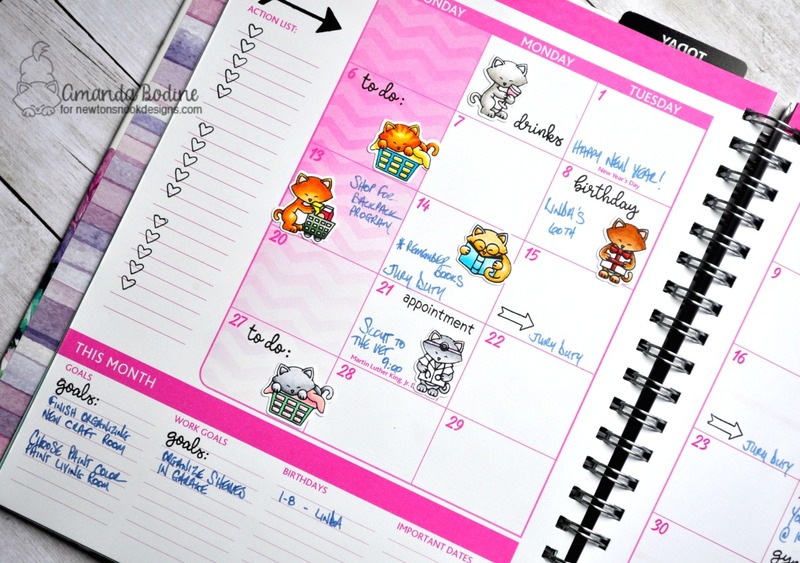 This is really my true personal schedule for this month. So what do you think? Is decorating a planner something you'd like to try? Thanks so much for joining me here today, make sure to keep scrolling for your chance to win! 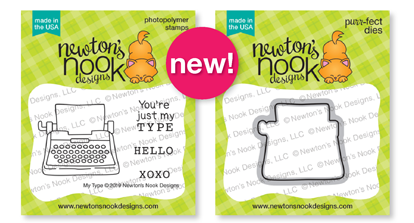 Day 1: Would you like to win the “Newton Makes Plans” or the “It’s a Plan” Stamp Set? 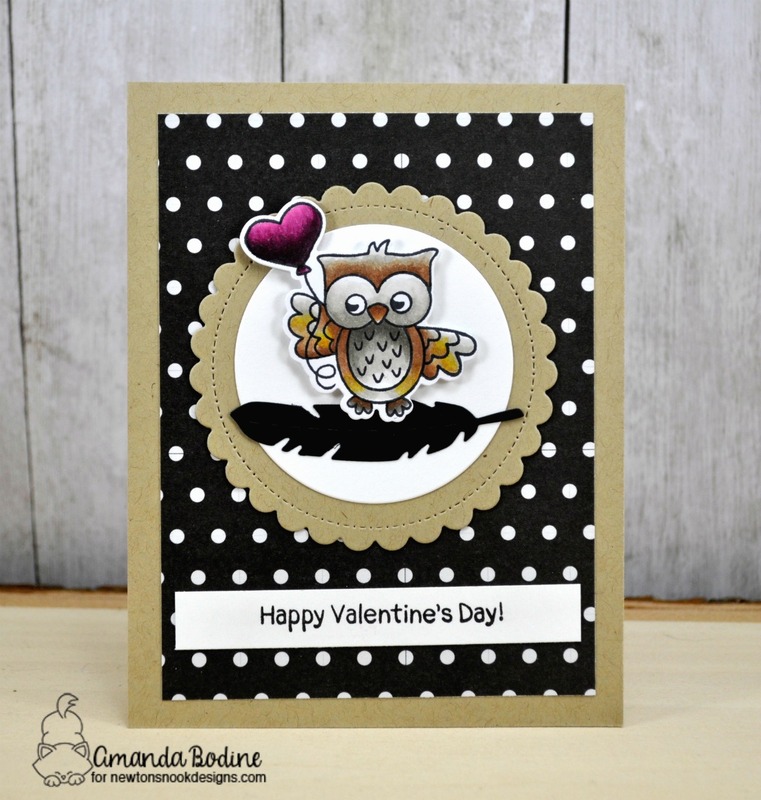 Hi all, I’m here today with a quick card using Winter Woofs stamp and coordinating die set! Over the holiday vacation I spent a few days with my cousin Linda and she’s got a pretty Husky named Riley that looks like this guy I colored. I cut a snow hill using the Land Borders die set. I arranged my scene over the stenciled sky using the Snowfall Stencil. Lastly I did a little inking on my sky and arranged the card!